Survivor released its debut album in 1979. Like most bands, they have had ups and downs, legal issues, and many personnel changes. Through it all, they have maintained a loyal following. The Seneca Allegany Events Center was about three-quarters full but the fans were clearly ready to hear some of the biggest hits of the ‘80s. The band delivered during the course of their 90 minute-plus set. It’s rare for a band that had success with more than one singer to have those singers together on the same stage. 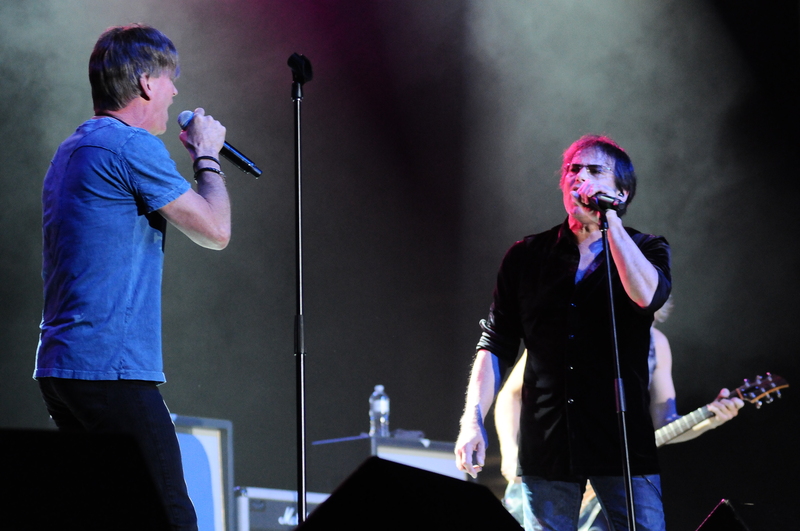 In 2013, original singer Dave Bickler returned joining Jimi Jamison (who returned in 2011) as co-lead singers. This would be like David Lee Roth and Sammy Hagar both touring with Van Halen. But founding member and lead guitarist Frankie Sullivan decided it would be a great thing for the fans to be able to hear both singers. The band also included bassist Billy Ozello, drummer Marc Droubay (longtime members who both left and came back) and guitarist/keyboardist Walter Tolentino. Opening with “Feels Like Love” from the Eye of the Tiger album, with Bickler and Jamison alternating on lead vocals, it was clear this band was on. The response was polite but a bit reserved for the first few songs. Then Jamison said he would need a little help singing the next song and that we would definitely know the words. Sure enough, the glorious keyboard intro to “High on You” followed and the crowd reacted accordingly. This was the first standing ovation of the night. After playing their first top 40 hit. “Poor Man’s Son”, Sullivan told the story of “Rockin’ into the Night” which he co-wrote. It became the first big hit for 38 Special. Survivor started playing it a few years ago. Both singers sang on this one as well. This became an extended jam with the guitarists tearing it up and another standing ovation. It was time to slow things down after that with an extended keyboard intro by Tolentino leading into one of the definitive ‘80s power ballads “The Search is Over” . Of course, Jamison doesn’t sound exactly as he did then but he sounds pretty close. Another guaranteed crowd-pleaser. “I Can’t Hold Back” started with a long guitar and drum intro. This was the best song of the night to me as it sounded as good or better than the studio version. Outstanding. The show closed with Sullivan telling the story of getting involved with Sylvester Stallone and the Rocky films. This led into the killer 1-2 punch of “Burning Heart” from Rocky IV and “Eye of the Tiger” from Rocky III. Both singers sang on each song. No need for an encore when you’re closing with your biggest hit. The only glaring omission was “Is This Love” which apparently has not been played live in years. These guys were having fun and really appreciated playing for their fans. Both Bickler and Jamison, in their early 60s, still have strong voices. Sullivan played up the guitar hero role all night and was matched by the rest of the band. This was a satisfying show. They provided nostalgia but there has been talk of a new album. This would be great to hear since both classic voices are on board. Survivor has certainly survived.